Desi chopper on carrier ops! Thats a beautiful sight. Moscow. February 2. 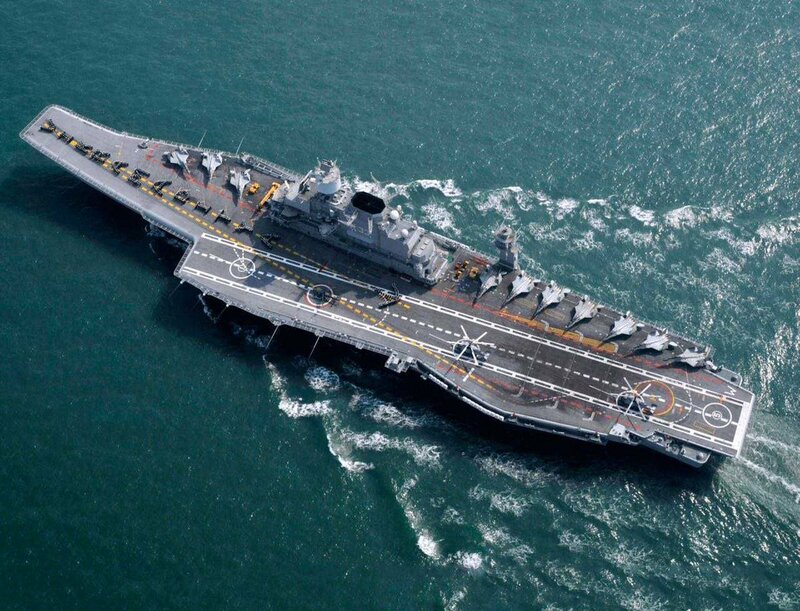 INTERFAX-AVN - After-sales support for the carrier ship Vikramaditya supplied by Russia to India is being carried out qualitatively, the aircraft carrier has been actively operating for five years, said the head of the logistics department of the Navy Vice Admiral Pabbi Gurjdeh Singh. 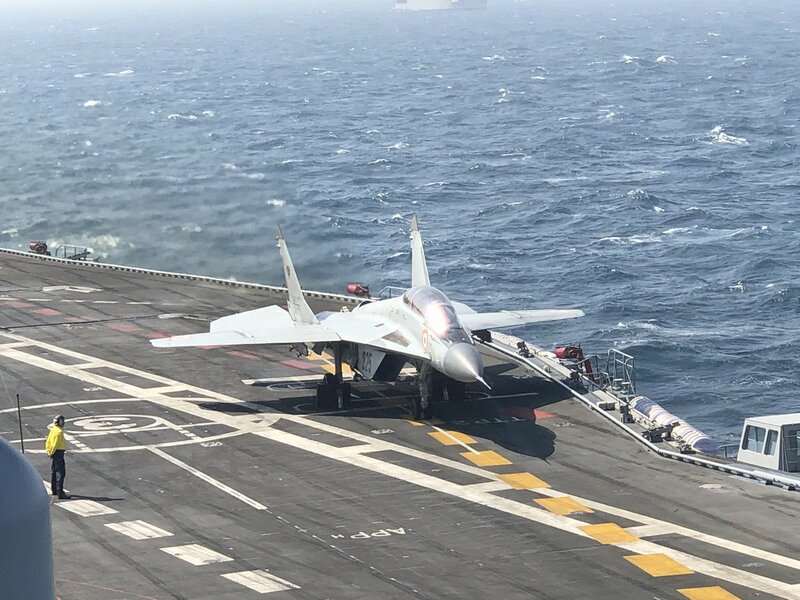 "Over the past five years, we have been very active in exploiting the aircraft carrier, it performs all its combat missions well and often goes to sea, which is a clear indication of the quality of Sevmash's work." I am pleased to note that the plant fulfills its obligations with high quality, - said the military commander in Severodvinsk during a meeting with the general director of Sevmash, Mikhail Budnychenko. "Today, as part of the Navy (navy) of India - it's the flagship," - said the vice-admiral, who is quoted by the press service of Sevmash. "The prospects for bilateral cooperation in post-warranty support for the aircraft carrier Vikramaditya were discussed at the meeting," the Interfax-AVN news agency reported on Friday recalled that the terms of the contract and the intergovernmental agreement determined that the Russian side (Rosoboronexport "and" Sevmash ") should provide full support in the operation of the aircraft carrier during the entire service life, which can be 40." Sevmash "carried out a deep modernization of the ship and handed it to the Navy Indy . in 2013. Now "Rosoboronexport" and the company implemented a comprehensive after-sales support system:. 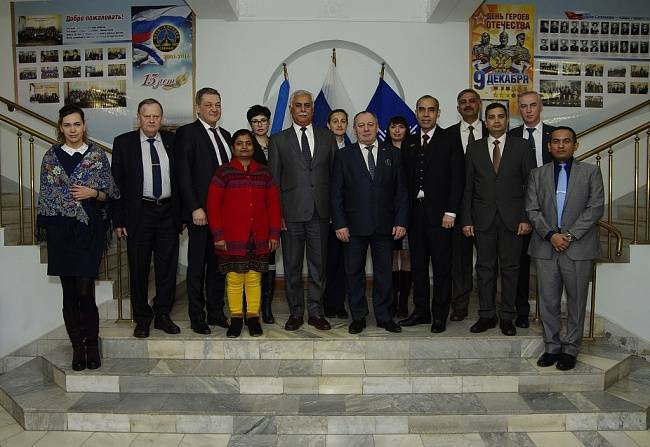 by providing technical assistance to the Indian Navy in maintenance in ship equipment to the creation of coastal infrastructure deployment and repair of aircraft carrier As previously noted M.Budnichenko, in 2017, the company on line of military-technical cooperation has completed the work in full, "- said in a press release. The aircraft carrier Vikramaditya (former heavy aircraft-carrying cruiser Admiral Gorshkov of Soviet construction) was handed over to the Indian Navy on November 16, 2013 at Sevmash, where the ship was being repaired and modernized. The contract for the modernization of the aircraft carrier was concluded with India in 2004. Nice. Very smooth for the restrictive length. Khan carriers seem to have more length margins for the takeoff, if the capture fails. Manish_P wrote: Nice. Very smooth for the restrictive length. Not just the length but the width is very restrictive as well. Look at the how close the landing Fulcrum comes to the parked planes and the edge of the deck! The amount of skills and iron nerves it must take. True. The Naval LCA would have had the advantage of a little more space there perhaps ? Manish_P wrote: True. The Naval LCA would have had the advantage of a little more space there perhaps ? Yes and I believe probably better navalized than MiG’s half-arsed job with the 29K. Imagine having to use instruments and other things that had to be “recalibrated” after the last landing. And the need to use them with such precision that is dictated by the horribly restrictive layout of a helo-carrier design to begin with. When the Vikrant comes online, our pilots will be given a lot more breathing room. That is a properly designed carrier deck. They deserve that and a better plane than the 29K tbh. The NLCA deserves consideration. landing at night in conditions like this on vikky must be a nerve wracking task. there aint no flare in carrier landings. its a controlled crash with nose level along the glide slope. tough. If this is not open source info, please ignore - we have the hawks as an ajt. Could we use the LCAN for carrier training like the goshawks in USN? Do we have goshawk (which are carrier capable hawks) type trainers with us? Prasad wrote: If this is not open source info, please ignore - we have the hawks as an ajt. Could we use the LCAN for carrier training like the goshawks in USN? Do we have goshawk (which are carrier capable hawks) type trainers with us? Singha wrote: landing at night in conditions like this on vikky must be a nerve wracking task. In the pitch-black darkness of night! And they do it with all the flunky quirks of russki gear. Can anything take more nerves and skills? The F-18 pilots have far larger margins for error. Even the SU-33 and J-15 pilots on the Kuznetsov class have more room. It is not bragging to say we have some of the best trained and most highly skilled carrier pilots in the world. Their situation demands it. Yes. Modern Russian engines are quite reliable. The MiG 29K, bought from Russia and inducted in 2010, has suffered repeated engine failures, with at least10 cases of single engine landings, a CAG report on the fleet has revealed. Out of 65 engines received from Russia, India had to reject or withdraw at least 40 from service due to these problems. Again, that is 40 RD-33 engines rejected or withdrawn from IN service out of a total of 65.
so far i have not seen night ops video off vikky, happy to be corrected. 4 deck edge lifts each capable of 2 fighters and 4 catapults is a unbeatable advantage in tempo and fault tolerance. a CVN can quickly launch 4 fighters and follow it up with a E2 a few mins later and more fighters kept on standby. Nothing beats a ski jump in launch rate. It is as fast as you can get the jets lined up. Singhaji, I found that video on a Vikramaditya thread. I think it is the Vikky. This is the Kuznetsov at night with a SU-33 landing. At 2:33, you can see three rows of lights flashing on. Those were not available on the 29K landing. I think the deck is much wider than the one in my other video too. Yes nothing like “Top Gun” except for the new chini propaganda video I posted in the Cheen mil thread — even TFTA amreekis say so. I want Bollywood to make us something like this velly velly much. only 2 takeoff spots vs 4 on a large cvn. bzzzt saar. and it was not until pearl harbour attack that it was demoed that carriers were the new king of the seas, and unattached to battleships could attack at high speed on their own , massing for effect and the disappear back into the wide ocean. no other platform could bring such weight and range to bear. that single day, battleships were rendered obsolete vs a carrier armed adversary. Not necessarily. Prolonged exposure to another aircraft's exhaust wash will lead to engine stalls, so you can't really stack them front-to-back on deck. And because a STOBAR jet needs a longer run there's less room to accommodate idling aircraft (assuming a similar deck area), so you'll have fewer aircraft on deck and ready to launch. Singha wrote: and it was not until pearl harbour attack that it was demoed that carriers were the new king of the seas, and unattached to battleships could attack at high speed on their own , massing for effect and the disappear back into the wide ocean. no other platform could bring such weight and range to bear. Ban him I say for persistent attempt to derail the thread. waylaing and seducing us innocent members with his battleship witchcraft. USN seems to have finalized on a hybrid war strategy in concert with usaf assets vs the growing power of anti shipping with the dragon. - B1 which by treaty is not nuclear armed, is now a versatile bomb and missile truck and brings a lot of heat to the fight...plus its good at low level and supersonic - based in places like guam it is a integral asset to the strike groups. we are never going to have enough carriers to fight the dragon 1:1 in the deep ocean. its time we built up the land based side of things to extend a hand. the car nicobar island can become our staging post. likewise if we can get a base in mauritius or seychelles atleast for LRMP & submarine purposes. LRASM is set to arm the Air Force's B-1B and the Navy's F/A-18E/F Super Hornets. What makes the LRASM/B-1B combination stand outis the sheer amount of firepower the heavy bomber can deliver. Just three bombers could launch 72 LRASMs at a target. the 1st new build tu160 rolled off the production line early this year. russia has intention to buy 50. we need to get in there and sign up for some 25. better this than S400. there she is , the first of the new . based in car nicobar and rajali and triv, the IOR will be our playground. far more effective buy than chinooks and apaches imo not to speak of the NASAMs boo woo. old confuscian saying "the wise embrace their destiny and prepare, rather than wait to be overtaken by adverse events"
using the IAC-I deck layout as a template.The lifts should be large enough for JSF, NLCA ( easy) and 12t heavy helos. These 3 to 4 amphibs could patrol the IOR at different locations , in concert with the 2 CBGs or on their own as well. but the sortie rate of such LHD ships like wasp/tarawa/america class using vstol jets like harrier or jsf is by design not so great because a lot of interior is devoted to the marine mission and lot of transport helicopters. a good soln would be the Hyuga class, only 20,000t full load (reasonable cost) and room for 18 large helicopters - we could build and equip 6 of these to lead their own task groups away from the real fixed wing carriers - which will at best be 3. the big helis can also fly 250km out with 2 harpoons for light targets or sneaky low level attacks. the tubby EU designs of the rotterdam/mistral/juan carlos refugee hunting and flag waving school is NOT what we need. Singha wrote: the 1st new build tu160 rolled off the production line early this year. russia has intention to buy 50. we need to get in there and sign up for some 25. better this than S400. +1, except for the Chinooks part. Yes, after retirement of Tu 142 we don't have any long range military aircraft. Unless of course, rumors of Tu 22 being with IAF were true. Singha wrote: old confuscian saying "the wise embrace their destiny and prepare, rather than wait to be overtaken by adverse events"
What is your qualification long range military AC or you talking about a long range bomber? As for Tu-22m it was never in service with Navy nor was it ever considered. Backfires were offered as far back in the '70s after the war to the IAF.ACM PC Lal didn't want them! Not too long ago the IN was on the verge of acquiring a small number linked with some other deals.TU-142 Bears have been replaced by P-8Is,which are more modern platforms-easier to operate,but with some below-par performance(CAG),but do not have the massive range of the Bear which is still being used by the Russians as LR maritime and nuclear strike bombers.Last ops in Syria. Yes, the proposal for amphibs will have shortfalls,less capability than a full-blown CV,but with more modern aircraft,better capability than the Viraat.they are meant to be complementary in case of a crisis adding to the number of aricraft available at sea. The only other affordable alternative that I can see is for the IN to go in for a sister ship of the IAC-1,with larger lifts,and let the amphibs be of JC class but with ski-jumps in the event of JSFs being available in the future.This way we'll have 3 med. size carriers plus 3-4 amphibs. Building the sister ship of the IAC-1 should take much ;less time and having similar machinery and eqpt. would b cost-effective,crew training,etc. ^ IN was never on verge of getting Tu-22m, russia threw them in various deals like Amur as sweeteners and that was only way IN would have ever gotten it, tsarkar or someone can correct me on that. P-8I have a range of around 7500 km and 1350 mile combat radius with 4 hour on Station sure that is less than 12k+ km range of Tu-142 but by no means short range. 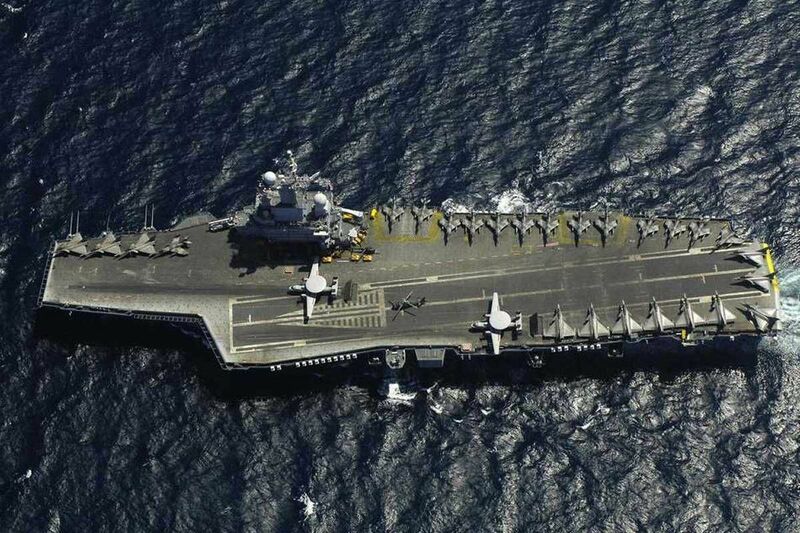 This is not directly related to INS Vikramaditya (the subject of this thread). It is on the HMS Queen Elisabeth. However it has a lot of useful information on carrier operations, cost overruns, carrier support groups, EMALS vs Ski jumps that i think it will be useful here. i saw a film yesterday where a jihadi attempts to denote a n-device using a speedboat near turkey in middle of a 6th fleet formation featuring a carrier and its escorts. the hero manages to drop the device in the water before it explodes and creates a huge tidal wave. the ships get a few mins of warning to prepare , get awash in huge waves but survive. interesting thing is the NBC lockdown. - all hatches and doors are closed and people clear out of the carrier deck also. - the HVAC systems will no doubt be sealed to external air and recirculate internally. is this fitted onto all warships incl ours? The FAS did report the Tupolev flying with IN. They are one of the more credible sources. 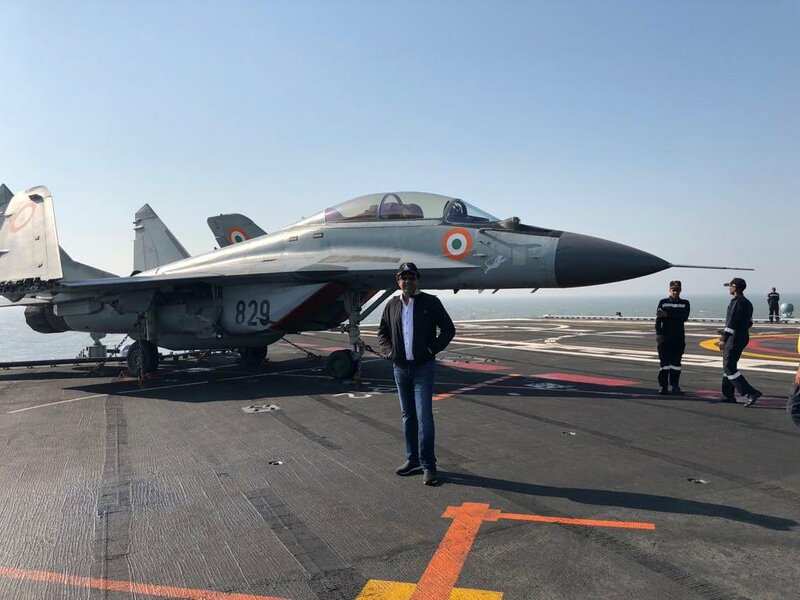 https://twitter.com/JainSiddharth_/stat ... 3637817345 ---> Day At Sea: Aboard INS Vikramaditya, the Indian Navy's largest warship. Absolutely exhilarating experience! To understand what our armed forces do, seeing is believing! 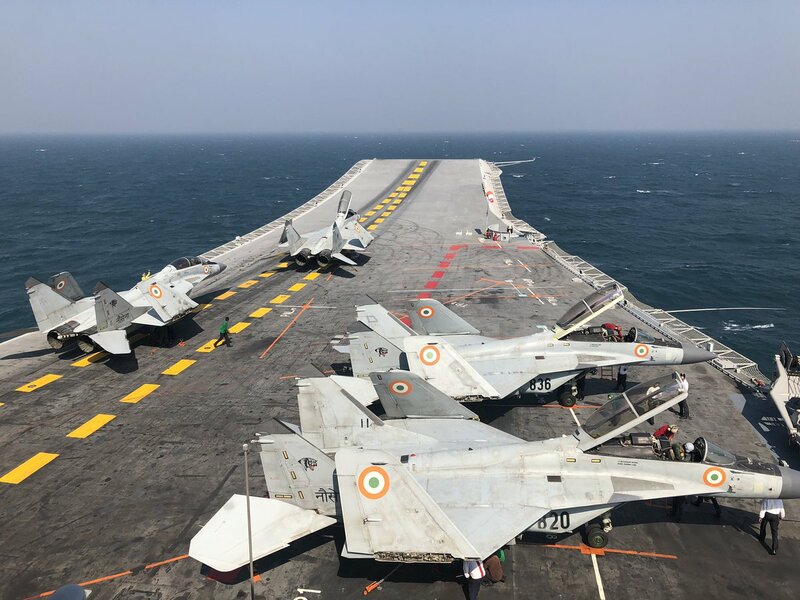 https://twitter.com/VinodDX9/status/1082998882093621249 ---> INS Vikramaditya and FNS Charles De Gaulle soon may conduct a joint exercise.